It's heavy! The fabric is made of American fleece in 80% Cotton, 20% Polyester and has a weight of 520gr (1.2lbs/sgm). The hood is lined with thermal waffle fabric in contrast color and is loaded with lots of "goodies" such as felt application on chest and arm, GASP symbol on back of hood, 2X2 ribbed details, etc, etc. It's the heaviest GASP hood ever made! 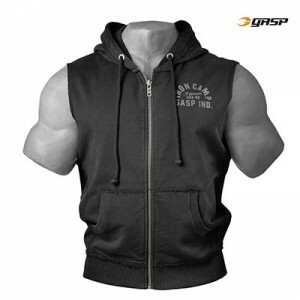 This is one good looking, comfortable, durable hoodie. The shirt for everyone who want to represent GASP in their everyday life! The Broad Street L/S is made out of a cotton slub fabric and is loaded with rough details. It features a scoop neck, a vintage inspired look and raw details. 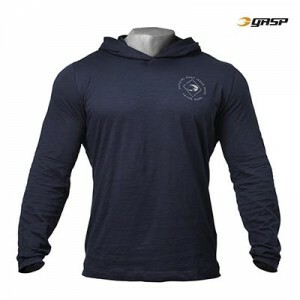 It’s somewhat longer than the average GASP shirt and fitted over the shoulders and chest to enhance the impression of your physique. Fitted over the shoulders and chest – enhances the impression of your physique! The Heritage Hood is a slightly modified take on some of our most successful GASP products of all time. “Hood on. World Off” has become somewhat of a GASP tag line as so many of our customers like to throw on their hood, their headphones and disappear into their zone as if to say “Don’t F#*K with Me While I’m Training.” And we’re all for that. 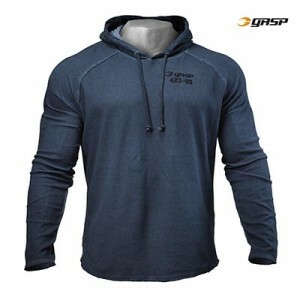 This light weight hoodie is made from Micro Thermal which allows for great mobility and comfort, and the raglan cut fits developed shoulders well. This hoodie, like all of the Heritage Collection, is given a dirty oil wash, to enhance the vintage feeling and further resemble something that might have draped over an iron warrior of the past. Sturdy and purposeful this is a hoodie we know you will love. Cotton polyester blend in waffle structured fabric. Lightweight and comfortable, the Long Sleeve Thermal Hoodie can be worn before, during or after training. Made of our popular cotton & polyester thermal blend, it features a cotton drawstring and rounded bottom for a great fit. The GASP Industries print is featured across the front and on the back. Loose fit pullover style hood loaded with details, stitching and attitude. Raw edges with overlock stitches along the hood, cuffs and bottom. We know that living the GASP lifestyle isn’t all nice and fancy. It is a rough and tough no compromises lifestyle. Which means the gear you wear must live up the challenge. That is why we enlist the help of our community, including some of our most notable GASP athletes when we develop and design products. 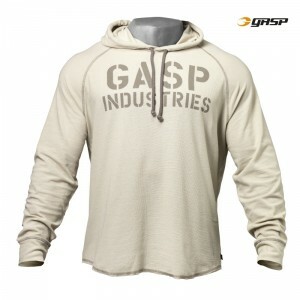 The name says it all, the Pro GASP Hood is a solid pro level hoodie with attention to detail. The clean look makes it perfect for any situation.